‘Economic tools in LCA – Life cycle costing, external costs and cost‑benefit analysis‘. This course brings together experienced teachers from Germany, Spain and Denmark for an introduction to the technique of life cycle costing (LCC). In the course the objective and scope of LCC are illustrated with case studies. We will also discuss macroeconomic concepts with relevance for LCA as well as the distinction between biophysical, economic and social externalities and their consistent treatment in LCA and Cost-Benefit Analysis (CBA). Different procedures for monetary valuation and socio-economic classes and distributional analysis are also on the menu for the course, as is the rationale and procedure for discounting. Finally, all of this is then related to the ISO standardisation of LCC, CBA, and monetary valuation. All in all, a very complete approach to the theme of economic tools in LCA. ILCA is very pleased to welcome Anne-Marie Boulay as a member of the ILCA Advisory Board. Anne-Marie represents the Forum for Sustainability through Life Cycle Innovation e.V. (FSLCI) in her capacity as the Vice-Chair of the Board of Directors. The FSLCI is a multi-stakeholder and membership-based community organization for professionals working in business, science and policy organizations who are interested in and working with Life Cycle approaches to enhance the sustainability of economic activities. It’s core objective is to promote life cycle thinking globally through a grass-roots and community-driven outreach process. It was established 2015 as a registered non-profit organization in Berlin, Germany and organizes workshops, summer schools, webinars and other events around life cycle thinking. The FSLCI also offers a global information hub with a jobs market and events calendar for the life cycle community. We look forward to interact with Anne-Marie and FSLCI in our continued effort to develop and improve our educational activities. Today the presentation of the 2017 Awards of the International Life Cycle Academy took place at the 23rd. SETAC Europe LCA Case Studies Symposium in Barcelona. The 6 Awards of the International Life Cycle Academy are given to honour contributions of outstanding quality, within the last or current year, within the field of quantitative sustainability assessment. Equal weight is given to scientific content and application/communication. This is the first year that the Awards are presented, and it is with great appreciation that ILCA has received the support of Springer and Elsevier for the Award prices. The entire award speech by ILCA president Bo Weidema can be read here: Academy award 2007. Do yourself the favour of reading the outstanding articles from the 6 winners! 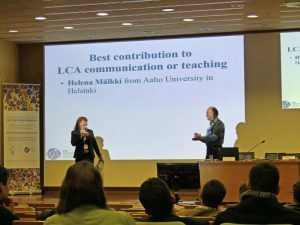 Helena Mälkki receiving her Award for both lifetime effort and best current article on LCA teaching.